Description: CSX Jordan Spreader makes ready for a day of ditch clearing activities with a 3000 hp assist from 5515. 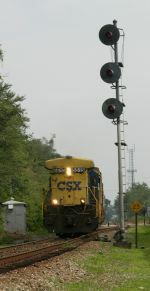 Description: A CSX local job with B30-7 5515 holds the main in Athens Ga. while it's shoving platform, a former Chessie cab stands to the side. Description: CSX local job A741 srurries south through Palmetto Ga with a loan B30-7 running long hod forward at track speed. The job is enroute to Newnan to finish the days work. Description: A712 has completed their work for the night and the jobs power rest at 23:00 and waits for the next days work on A716. Description: A712 has completed their work for the night. Mean while the main line activities continue through the night. A south bound TOFC train passes the resting B30-7s at 23:45. Description: A close up look at the lead unit of the Taft Switcher. Description: The Taft Switcher is returning from Longwood and heading back to Orlando. Description: The Taft local is heading toward Longwood. Description: A crewman rides the lead car as the train comes back to Cartersville after switching an industry north of town. Description: A short local heads south. Description: How about those new dropcenter centerbeam cars? Description: A779 has pulled Q178's entire train out of Taft Ramp into Taft siding & is backing around the loop. An unusual move they do not often perform & could have been accomplished by simply shoving from the ramp track they were already in.....Q178 is usually staged at Rachel's after Q177 arrives.